A heady cocktail of cabaret, new burlesque and circus sideshow. Ursula Martinez is an original cast member of the smash hit, Olivier Award-winning show La Clique which featured an extraordinary line-up of uniquely talented performers from around the world; Captain Frodo, Miss Behave, The English Gents, Mario Queen of The Circus, Camille O’Sullivan, The Wau Wau Sisters, David O’Mer, Meow Meow, The Skating Willers….. to name but a few. 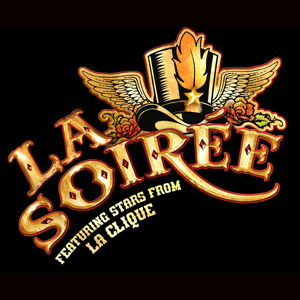 Now this collective of artists are performing their outrageous, hilarious, beautiful, breath-taking and bizarre acts in La Soiree, an ever more inspired melange of cabaret, new burlesque, circus, sideshow, variety and contemporary vaudeville. Capturing the hearts of audiences around the world, from London to Stockholm to Sydney.